Soups are a hearty meal-in-a-bowl, completely customizable with limitless possibilities. Unfortunately, many soups are high in fat, calories, and sodium. Pot roast soups, thick and creamy chowders, chicken and dumplings soups, hearty bisques, and more are delicious but extra fattening. Luckily, low fat and low calorie soups can still be super flavorful and satisfying, and are easy to make at home. Carrots and zucchini, two affordable and healthy veggies, come together to make this thick and hearty soup with only a few ingredients needed. If you don't like curry, you could try variations with other spices, including cilantro and cumin for a Southwestern spin. Ready in 30 minutes flat, this soup is perfect for a weeknight dinner. Miso soup contains a short list of ingredients that can be found in a specialty grocery store or the Asian foods section of your local market. Veggie-friendly and full of umami flavor, it is surprisingly easy to make. Load it up with veggies to make it more filling. Green and loaded with nutrients, a little potato and low-fat milk help keep this broccoli soup creamy and satisfying. Even broccoli-haters will love this blended soup, perfect for lunch but filling enough for dinner. Vegan and cholesterol-free, this soup is still hearty enough to feed to the meat-eaters in your life. 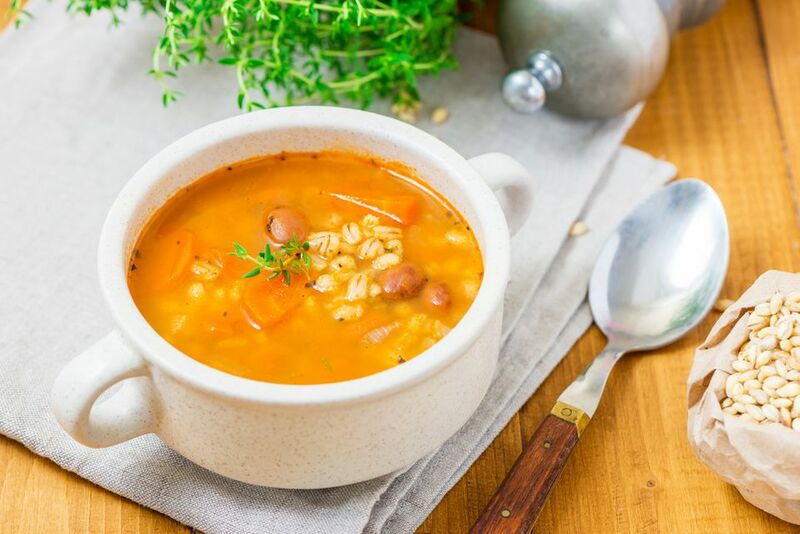 The barley and beans help make the soup full-bodied as well as high in fiber. Add whatever veggies you have on hand, but don't skimp on the seasoning and use high-quality broth. What cauliflower lacks in color, it makes up for in nutrients. A member of the same family as broccoli, cabbage, and kale, cauliflower makes a wonderful base for a soup. Even without dairy, this soup is creamy and delicious. If you don't care for dill, swap it out for other fresh herbs like parsley or thyme. 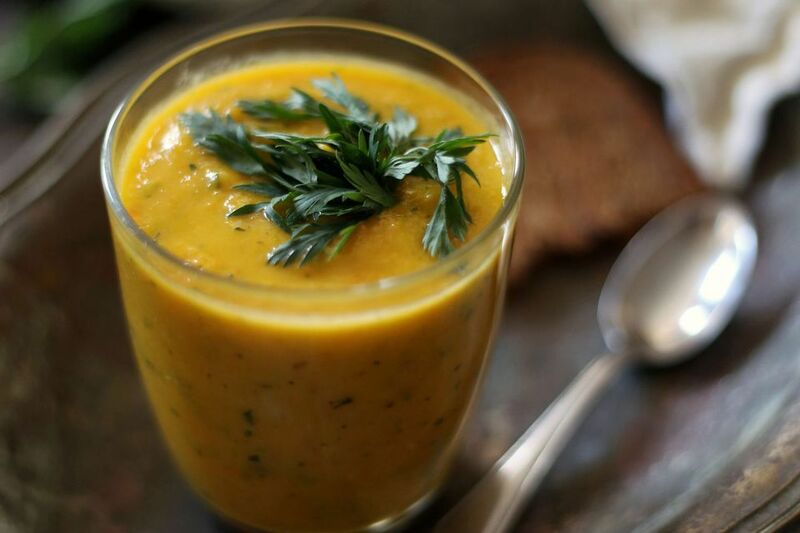 Butternut squash has a lightly sweet flavor and creamy texture, making it ideal for blended soups. Since it is flavorful all on its own, you don't need to add a bunch of fat to make a great soup. Customize the recipe by adding fresh herbs or spices, beans, or chopped, cooked veggies. You might think that reaching for a standard tomato soup is always a healthy choice, but its often very high in sodium and surprisingly high in fat. This recipe for Healthy Tomato Basil Soup has all the flavor of its higher-fat cousins without the guilt. Flavored with a ham bone or ham hock, lentil soup has lots of smoky, meaty flavor without a bunch of fatty meat. Keep an eye on the salt in this recipe—if you use a salty ham hock or salted broth, then wait to add more salt until the end. This bright green soup is fresh-tasting and packed with vitamins. The vibrant color is maintained by adding half of the fresh spinach just before blending. With very low in calories per serving, you can enjoy it with some crusty whole grain bread. Roasted red beets give borscht its signature hue, while cabbage and white beans add heft. Garlic, caraway seeds, lemon juice, and dill liven things up, and the soup can be topped with low fat sour cream or yogurt. Serve hot or cold. Cream-based soups usually have too much fat, sodium, calories, and preservatives. But by using fat-free dairy, you can make a soup that is soul-satisfying while eliminating much of the fat. The vegetables and herbs transform this soup into chicken pot pie without the crust. Whip together this low-fat, low-calorie vegan soup in just twenty minutes. Replace half of the nondairy milk with vegetable broth to make the soup more savory, and top with fresh herbs and toasted pumpkin seeds for some added texture. Tom Yum Kung is a popular Thai soup that is salty, sour, sweet, and spicy. It traditionally has coconut milk as its base, but this recipe leaves out the high-calorie milk without skimping on flavor. Replace the shrimp with more veggies if you're vegetarian. Black-eyed pea soup tends to be chock full of ground beef, but a vegetarian version is just as satisfying. With macaroni noodles, heart-healthy black-eyed peas, and a base of tomato and vegetable juice, it'll be sure to warm you up and fill you up.